Yesterday, October 9th, my blog had a birthday. It turned ten. Well, I have been thinking (nay, dreaming) of having my very own knitting blog for some time now, and, so here it is. I look up way too many patterns and spend too much time reading about knitting on the internet to not join in the knitting blog fun. So, I intend to use my new blog for much knitty goodness: pictures of things I knit, pictures of things I wish I could knit, track the progress of my knitting, and keep up with all my knitting buddies (which is about...hmm, three people). 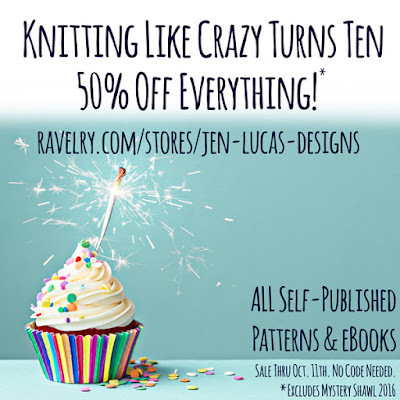 So, in honor of this blog being 10, I'm running my biggest sale of all time! Get 50% off all my self-published patterns and eBooks thru tomorrow, October 11th! No coupon needed, discount will be applied at checkout. Only the MKAL Shawl pattern is excluded, because that is already deeply discounted. Enjoy! And happy birthday blog!